The latest Little Free Library from Fossil Forge is ready for sharing! 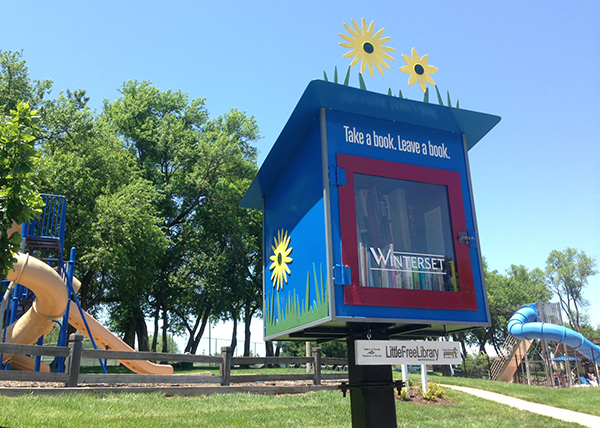 This Library is located in the Winterset neighborhood in Lee's Summit, Mo. It is located at the community park and swimming pool. This Library was a collaborative effort between the neighborhood, developer and Fossil Forge. The design captures the elements of a garden shed. Flowers decorate the top and sides of this special Library. The Library is made of steel. It is painted with enamel paint for added durability. Special graphics add personality. This Library is large. It can comfortably hold dozens of books. There is even a shelf inside to better organize the books. Sidewalks and streets lead the way to this community-centered box. Time to share books!